The premise of any self-paced e-learning course is that learners will learn at their pace. It provides learners the options of what, where, when, and how to learn. They are in total control of their learning. But the risk here is, the learner can, at any time, lose interest in the course and discontinue if it fails to engage him or hold his interest. If this happens, the purpose of the course is lost. To mitigate this risk, as an instructional designer, you have to find ways to keep learners engaged and motivate them to go through the course. You need to come up with ideas that will make your learners want to know more, be eager to go to the next module, and ready to follow the instructional path you have designed. This is possible, provided you know the right way to design the course and follow certain dos and don’ts when designing self-paced courses. Get to know them in this blog. Interactivities maintain the attention of the learner and they provide a break from the passive action of looking and reading the screen. Just reading the text on the screen can be a monotonous activity and put off learners. Using interactivities such as drag and drop, drop down, hotspots, and rollovers and click and learn can help avoid this. For instance, drag and drop and drop down interactivities can make assessments more interesting. Hotspots and rollovers urge the learner to click on them to know more. Such interactivities make the learners do some actions such as clicking the mouse or typing a few words. Characters and avatars make learners pay attention. They find the course attractive if a character or avatar guides them through the course by speaking and interacting with them, rather than finding things out on their own. Avatars or characters help learners comprehend the subject in a better way. 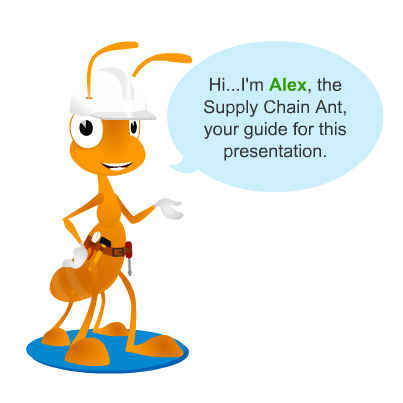 The avatar shown below was used for a course on supply chain management. Games and scenarios enliven a course. Games can be used to teach concepts in an engaging way. For instance, a course on customer relations was made engaging when employees were asked to identify customer problems by playing a game. 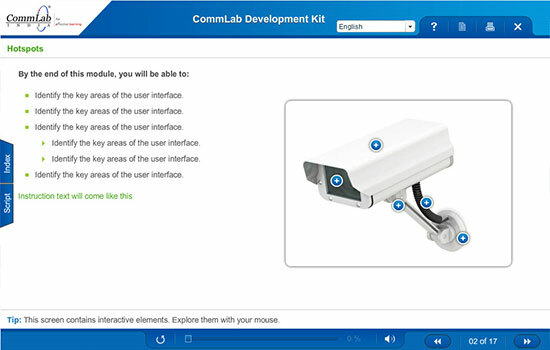 Scenarios connect the course to real life of the learners. For instance, a course on customer relations can incorporate scenarios where learners learn how to handle angry customers. 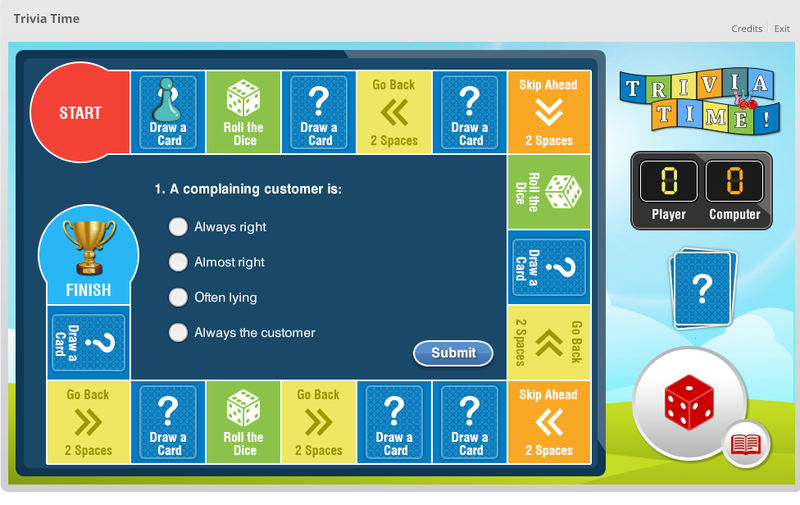 The scenarios in the course can depict situations where the customer is angry and the learner can be given different options for his response and guided to choose the right response. This is a better and interesting way of teaching him how to handle angry customers instead of giving him direct instructions. Self-paced courses are a solo activity, where the only interaction is between the learner and the computer. Going through such a course is monotonous and non-inspiring. To make it more interesting, a collaborative learning environment is the answer. This can be done by creating opportunities for learners to discuss, share and learn from each others’ experiences with options such as chat functionalities, discussion rooms, and social media. Such features not only keep the learners connected to each other but also create a sense of community among them. Interaction makes the course interesting as learners can share their knowledge and insights on the topic, which can improve their understanding. Rewards in the form of points, ranks, badges, or certificates can keep the learners motivated and urge them to finish the course. But ensure the reward is meaningful and serves a pupose for the learners, otherwise such rewards will have no meaning. When designing a self-paced course, it is important to know your audience. This will help you design the course at the existing knowledge level of learners. When the course caters to the level of the learner’s knowledge, it becomes more engaging for him. Extraneous information adds to the cognitive load of the learner, so avoid it. The course should contain only the essential material which the learner needs to know. For instance, any extraneous information in a compliance training module where the content is already dense will make the course heavier for the learner to comprehend and put him off. When using graphics and images, ask yourself how far they will help learners understand the concept without having to go through the text of the course. If they are self-explanatory or add to the learning, then they are worth using; if not, it is best to avoid them. Avoid using learning activities if they do not have a context. They should be relevant to the needs of the learner, otherwise they tend to put off the learner. Do not use PowerPoint presentations (PPTs) used in classroom sessions and call them e-learning. They just promote online reading. PowerPoint presentations can be adapted to e-learning by adding interactivities, changing the GUI, or by adding videos. Formal language is a big no-no when developing self-paced courses. Remember, these courses are between the computer and learner, and using formal language will only make the learner disinterested. Speaking in a conversational and direct way to the learner will create better learning. Avoid acronyms as they tend to confuse the learner. In a self-paced course, the learner cannot clarify the meaning immediately. Ideally, you should give clear explanations in an online course, leaving no room for confusion or ambiguity. These are some of the dos and don’ts you should follow when developing self-paced courses. Remember the ground rule is to keep the learner constantly engaged so that he goes through the complete course.